Studying and playing with code snippets is always a great way to learn and get comfortable using a new language. Compared to other popular languages like PHP and Java, it seems like there are far fewer Python snippet resources available. If you've been trying to find some helpful Python snippets to aid you in learning the language, check out the Acire Snippets Project. The project is an interactive initiative that not only houses a useful library of Python code snippets, but also allows you to interact with the snippets, change and customize them, and then run them as a great learning tool. 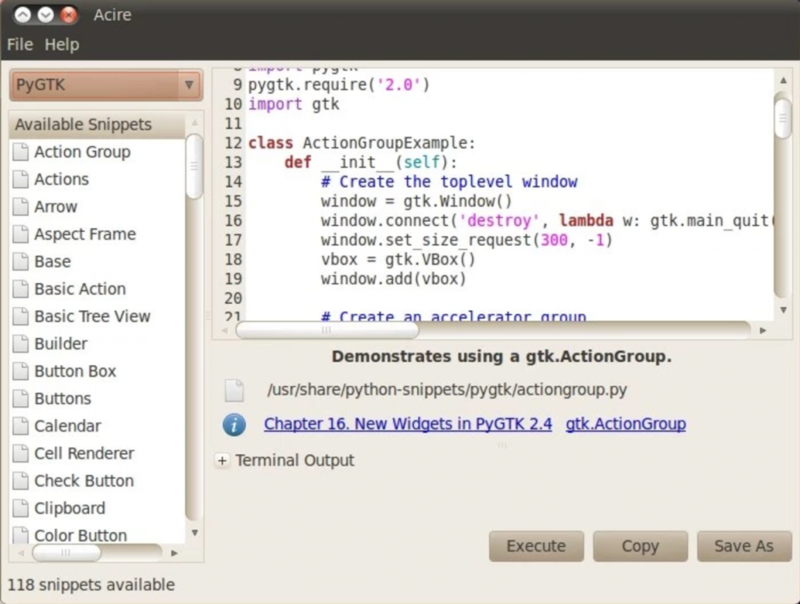 All of the snippets within the library demonstrate how to perform common and specific tasks, so it's a great place to start if you're only just beginning with Python. If you're a more seasoned Python coder, there's also the option to submit your own snippets to help teach others. The Acire Snippet Project features a diverse library of snippets and code with new snippets added daily. It offers support for many different languages (with more being added with every update). The project is also extremely user friendly and makes it easy to browse, play with, or rearrange snippets, and it's also super easy to submit your own.